Our Maleny Visitors Information Centre is a not for profit, long-standing, independent community service, run by volunteers. We are situated in the hub of the town with the office front in the centre of the main street at 2/23 Maple Street, Maleny. 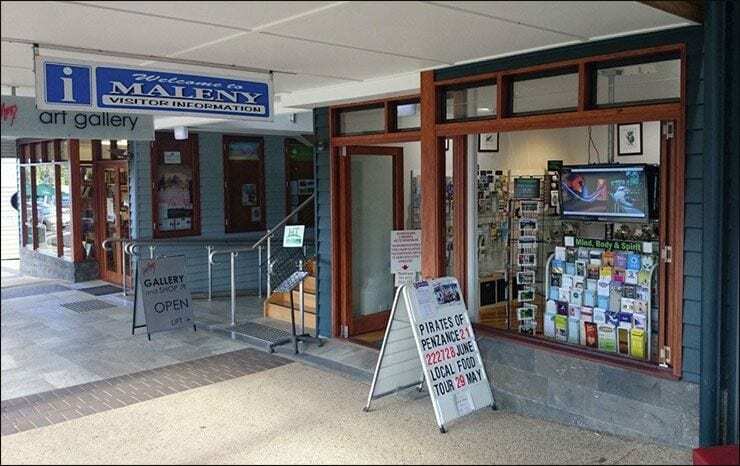 The open plan and entrance to the centre provide a friendly welcome to our many information services for Maleny and the Sunshine Coast Hinterland. The Centre runs with the very welcome financial support of the Sunshine Coast Council. Our major affiliations are with Hinterland Tourism, and Maleny Commerce. Many local businesses also provide us with great support. The Centre also provides information about local history, local and regional maps, parks, walking trails, schools, hospitals and other emergency services. A range of quality souvenirs and postcards, with a distinctively Maleny flavour, is available. We also act as a ticket selling agent for many local events. The web site allows access to information at all times. Our team of volunteers, who are mostly local residents, are always willing to help.